As the holidays approach, you might have already seen an invitation or two to your office’s holiday party. While these are a great way to celebrate with your co-workers, many worry about the usual office gift exchange, secret Santa, or white elephant. Don’t sweat it though! These are three Christmas food gift baskets that any co-worker would love to receive! 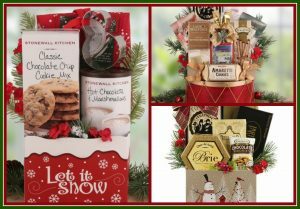 Let it Snow Gift – This gift basket has classic gourmet treats all packed into a festively decorated box. This box contains brie cheese and crackers, buttercrunch popcorn, cookies, and hot cocoa. This will give your coworker all of the snacks they need to stay cozy during the holidays. Holiday Drum – If you have a co-worker that enjoys holiday decorating more than the holiday itself, these Christmas food gift baskets are for them. This assortment of sweet treats comes in a reusable holiday drum! They can use this to decorate and enjoy for years to come after all of the goodies have been eaten. Thinking of You at the Holidays Gift – This gift is perfect for the co-worker who likes spending time with the family. This gift basket comes with all of the items necessary for making Christmas cookies and drinking hot cocoa. It even includes a cookie cutter and festive dish towels to really get everyone in the holiday spirit! Christmas food gift baskets are a perfect solution to your holiday gift exchange because it includes all of the fun and classic elements of the holidays. Between festive decorations and delicious gourmet treats, your recipient will be thrilled to open your gift! Shop all of BisketBaskets.com’s selection of holiday gift baskets to find the perfect gift for your holiday party today!